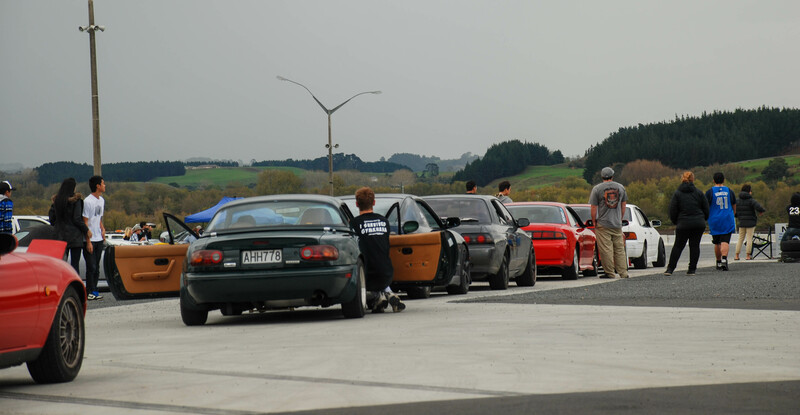 In New Zealand there is a lot of grass-root drifting events, one being held by the JDK Racing crew. 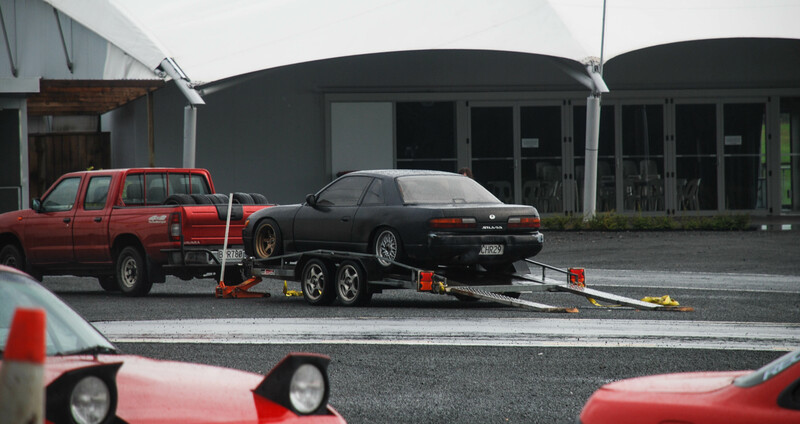 As any drift event, there is a long or short road trip to the destination, which this time was the skid pad at Hampton Downs Motorsport Park. 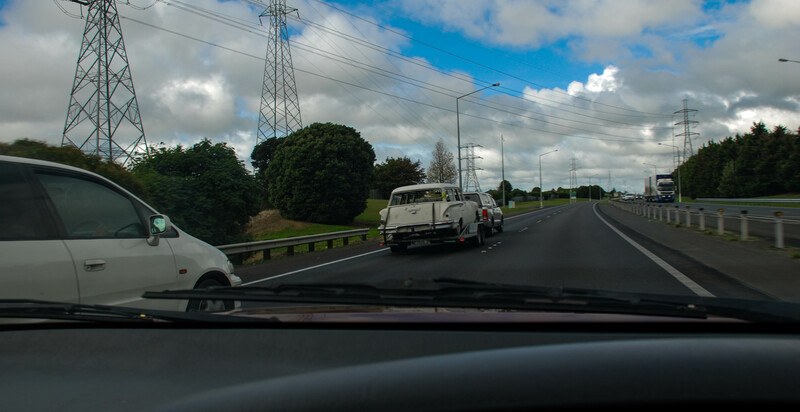 The trip from Auckland is about 1 hour, there are always interesting and different cars on the road to entertain you on your journey. 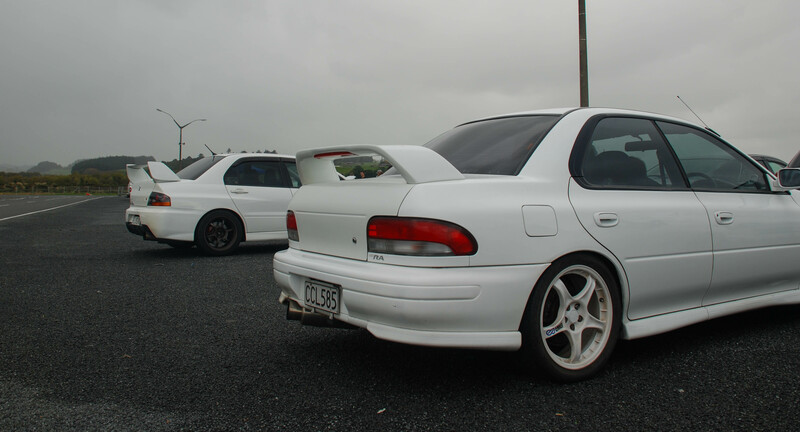 Whether it is new cars or old, there is no disappointing. I stopped off at the main petrol station for a bite and of course some petrol. 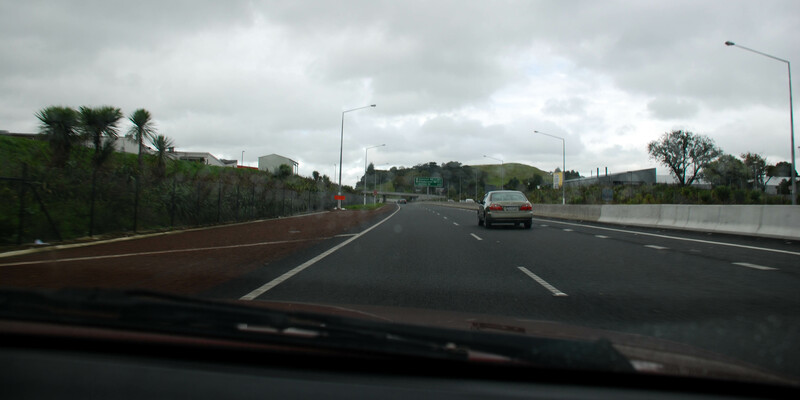 This is the main BP station that everyone fills up at when heading on their long road trips around the North Island. 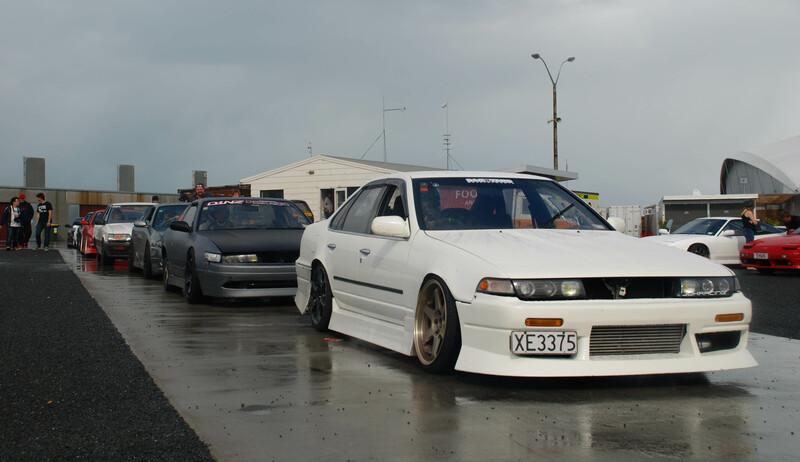 Also met up with some of the JDK Racing crew members in this angry looking Silvia before we headed off to Hampton Downs. 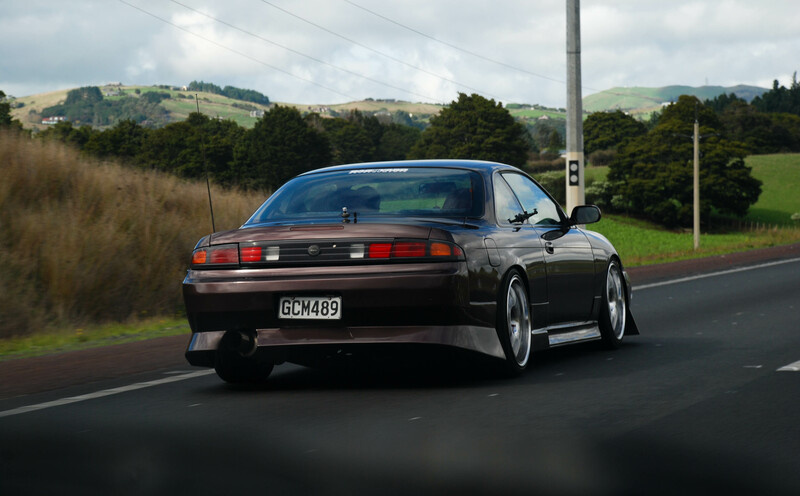 Its a 1995 Nissan Silvia Facelift SR20DET owned by Bernard Lim. 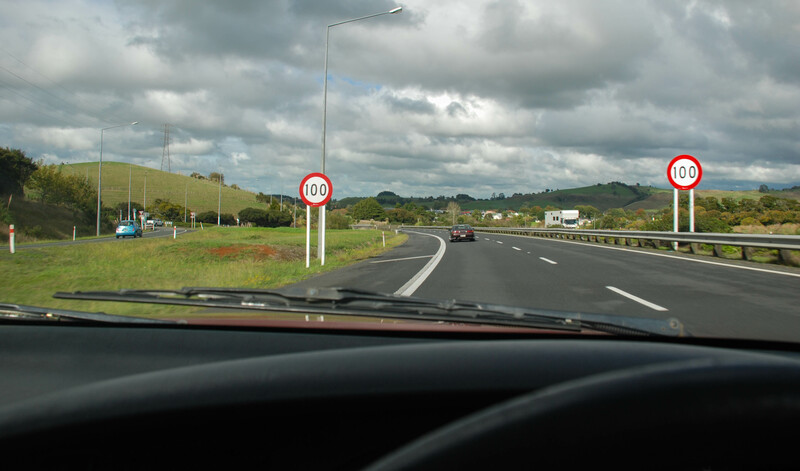 The road started to widen as the speed increased, everyone was eager to get to the track. 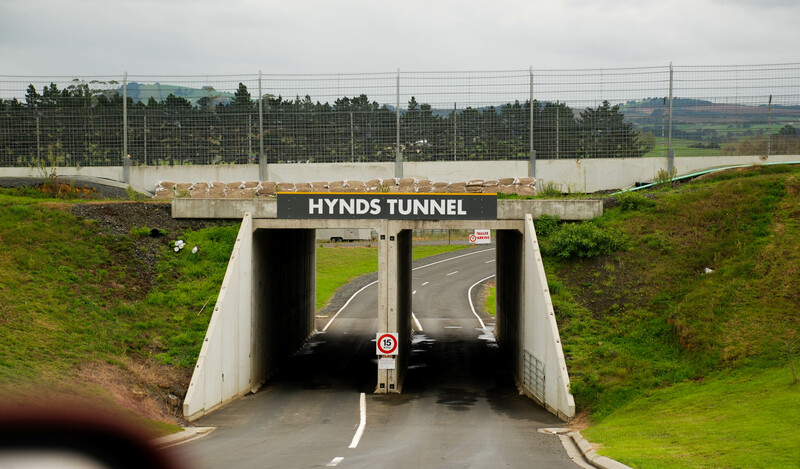 and a tunnel going right under the race track. 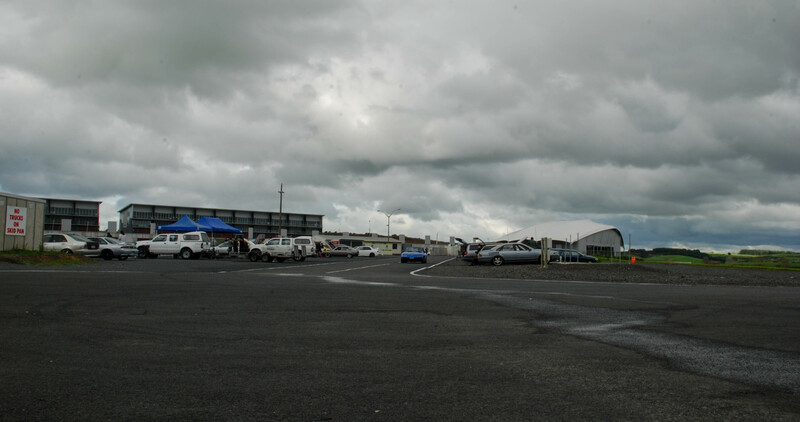 By this time plenty of people had already arrived, all the drivers, pit crew, helpers and spectators. 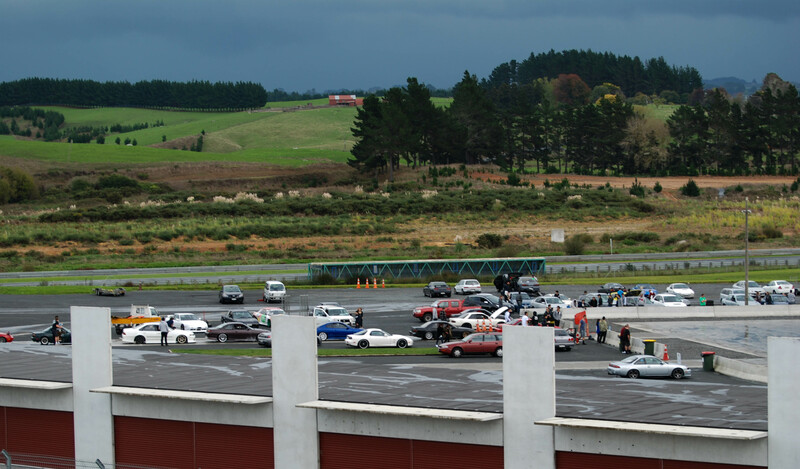 With each driver getting about 2-3 minutes on the skid pan, the line started to back up quite a fair bit. 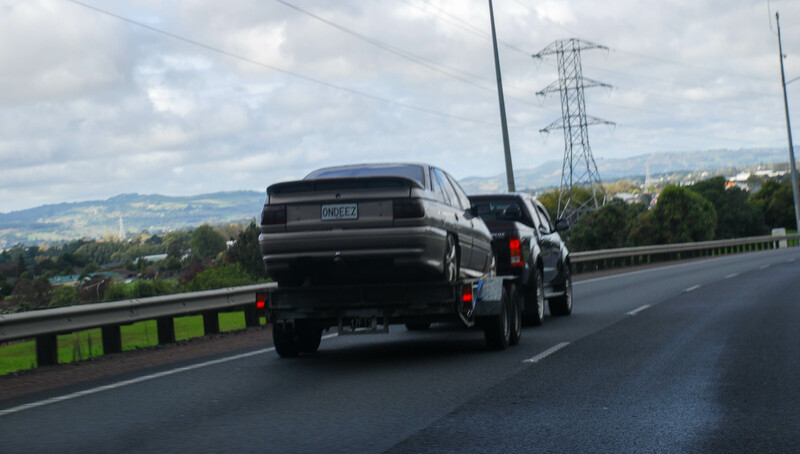 Even going around the corner, eager drivers awaited for another turn to trash their cars. 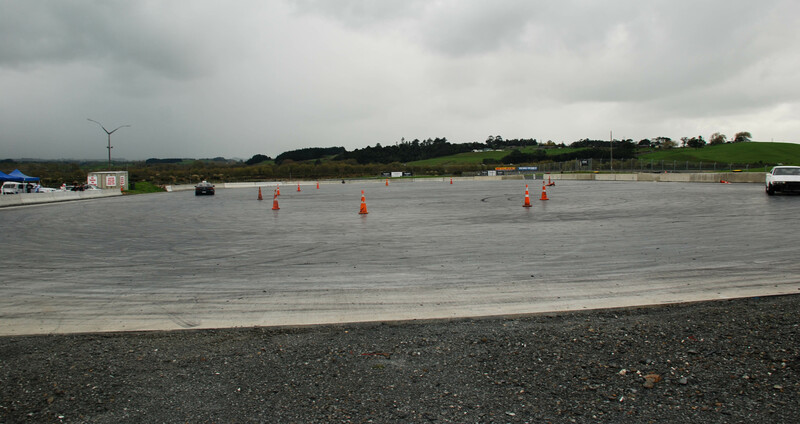 The pad is one of the largest concrete slabs in New Zealand and used 1,887.60 tons of concrete, 26,666 meters of stressing cable, 26 concrete layers and 140 trucks. 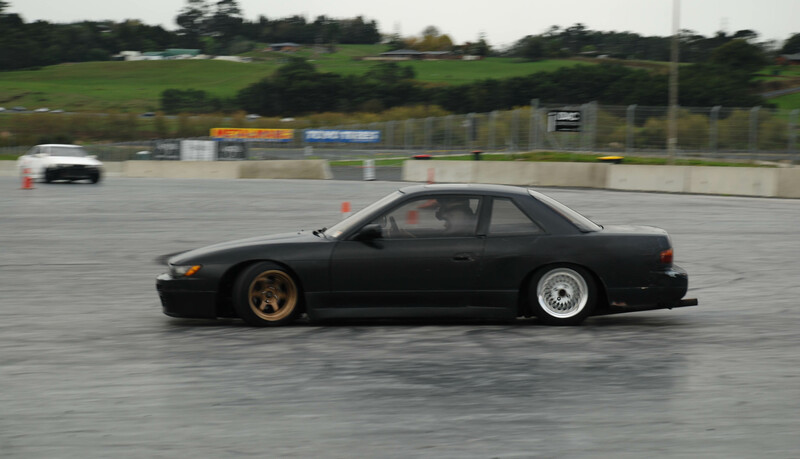 Ben Sharp in his SR20DE S13 was giving it a good go, holding his drifts with minimal spinning out. He even took me around for a good run. 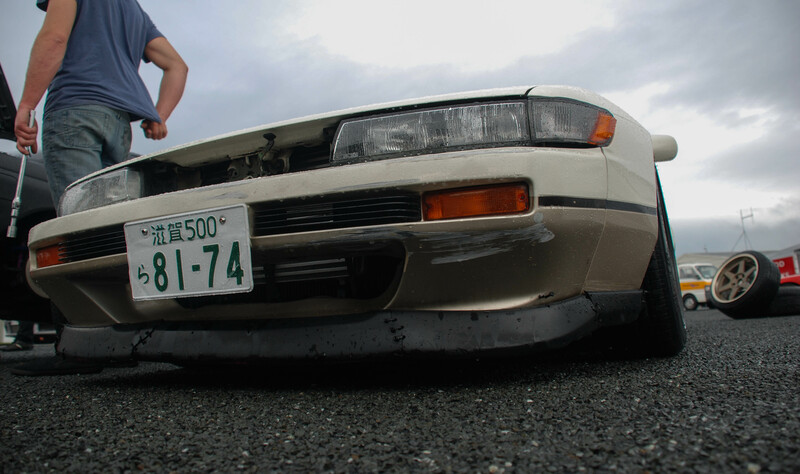 Throttle control was the main aspect to keeping a drift on this slippery surface. 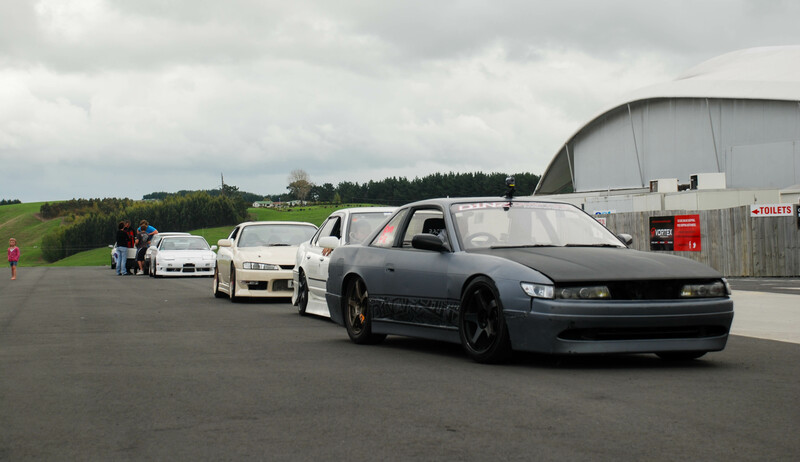 More and more cars had their turns, a very nice turbo facelift silvia, matching the timers flag. 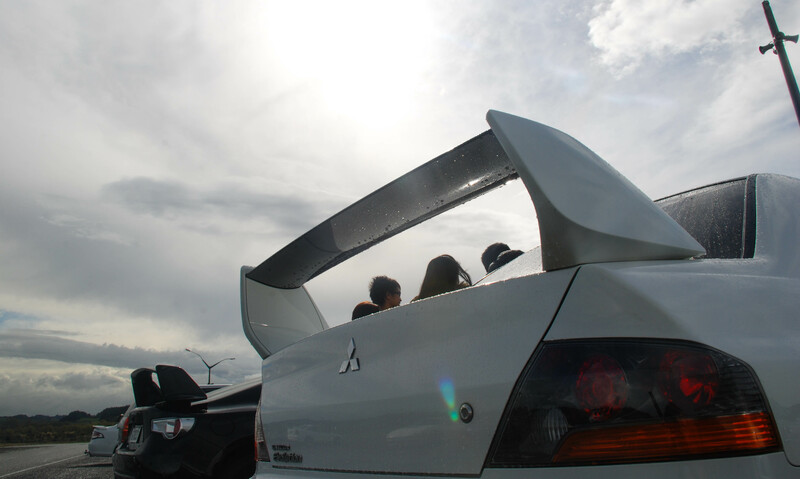 As like many other car events, the spectators always have some nice cars, these two watched onto the pad with envy. 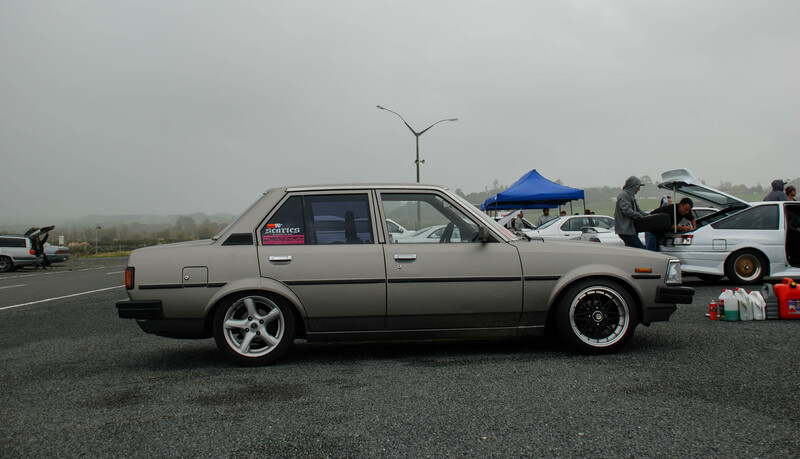 This corolla was probably one of the oldest cars drifting at the event, everything about it was nice, the sound, the look and the skids. 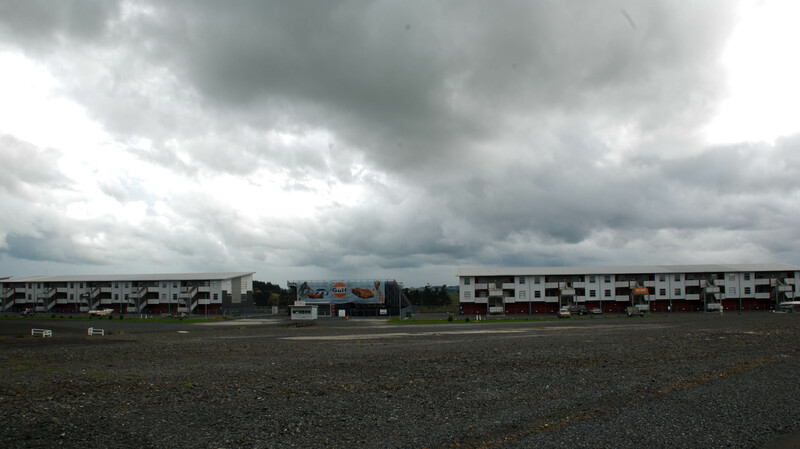 As the rain started to pour over us, drivers started to change to their daily tires in an effort to increase grip on the track. 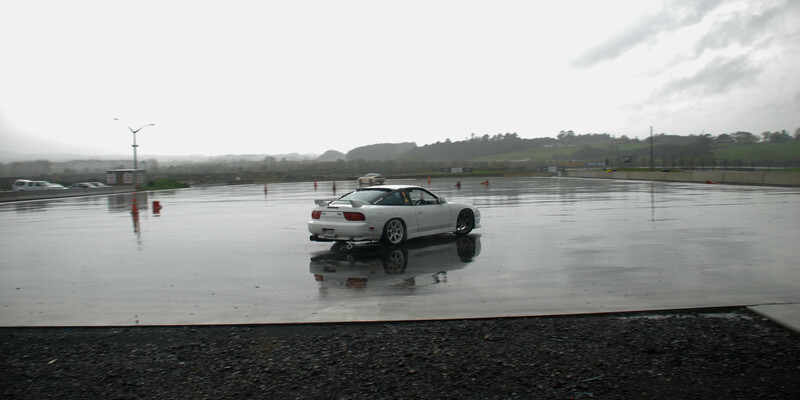 The track was fully covered in water by this time, if you have ever been on the skid pad at Hampton Downs you would know how horribly slippery it is when wet. 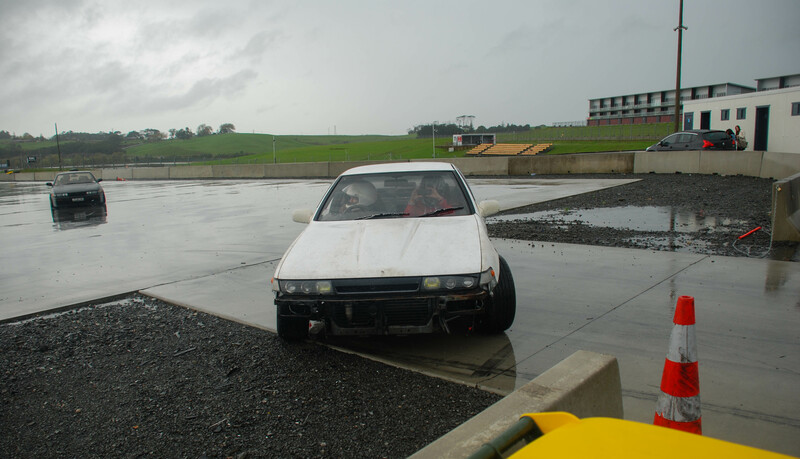 Unfortunately there were some casualties, Josh van Wyngaarden‘s AE86 Levin didn’t want to start up for him, ending his day short. The weather was sort of on and off with some heavy down pours, to some nice sun which created this nice little rainbow. 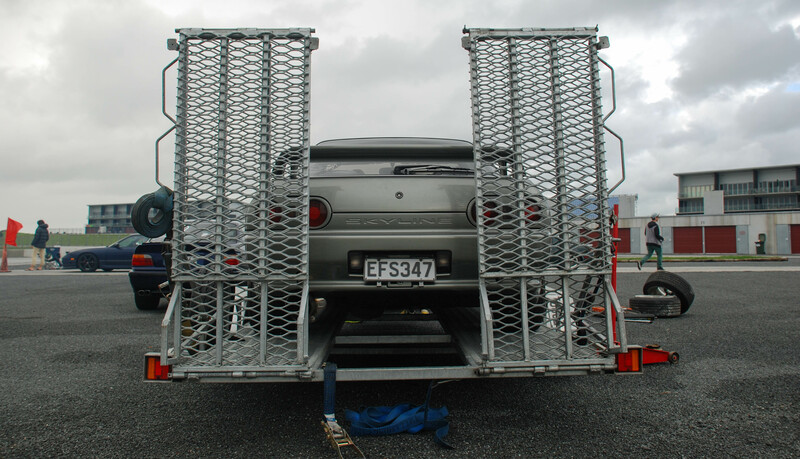 Some of you may recognise this car, Cameron Vernon’s Skinny R32 RB29 Skyline. Always looking bright and colourful. 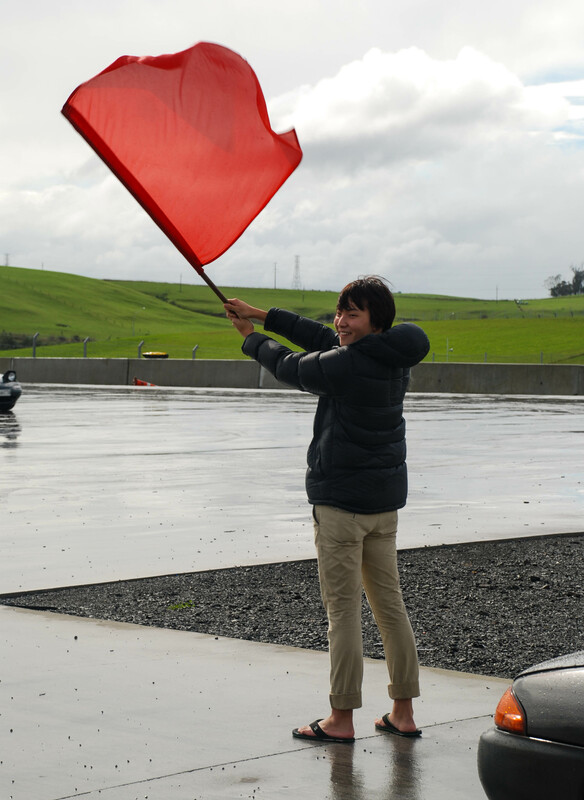 There wasn’t a dull moment for Danny Jeong, he just loved waving that flag around. 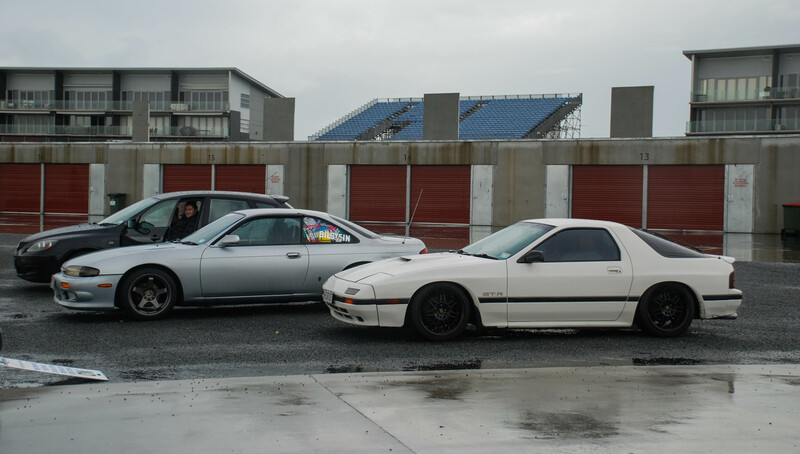 There was a lot of versatility with the cars on show at this drift day, cefiros, silvias, skylines, corollas, AE86s, MX5s, and even an S2000. Mr. Lim managed to start a fire under his car somehow resulting in a very messy car and engine bay. CK Hong was happy to put on a smile for me, not that it wasn’t already there. 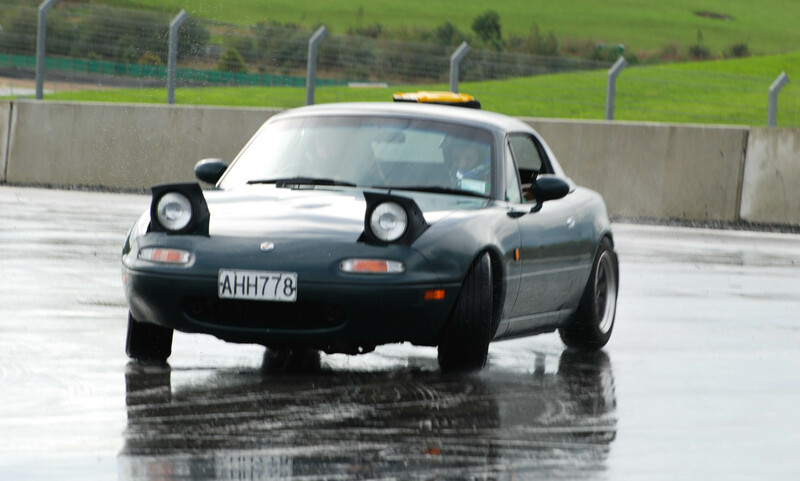 There were about 3 MX5s drifting, because they are under powered, the wet seemed to play as a positive rather than a negative for them. 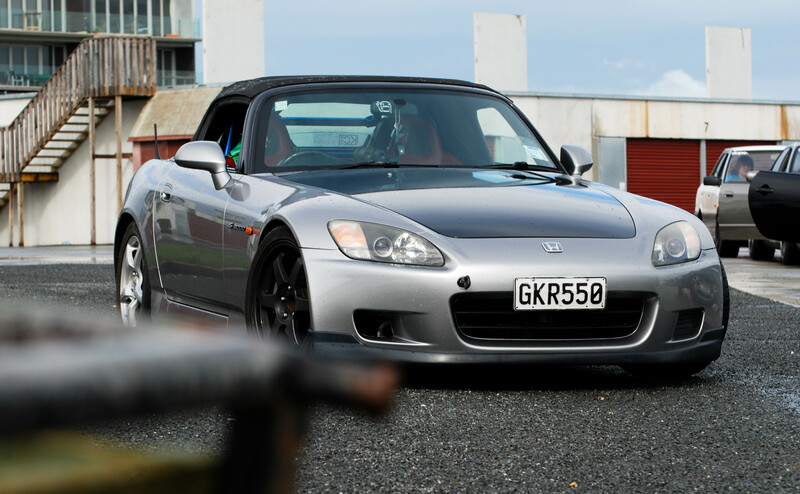 I must say Mr. Hongs S2000 is a piece of beauty. 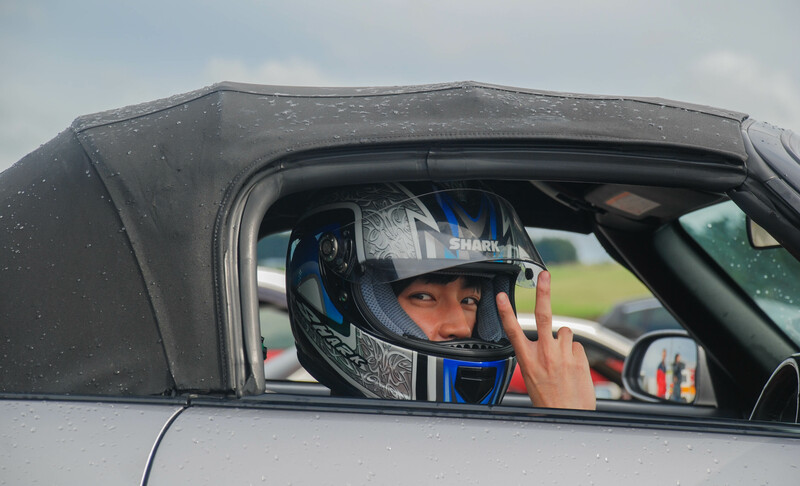 As well as Juhan Lee’s SR20DET S13, it mostly sat and watched today as he was helping out with the flags and other stuff. 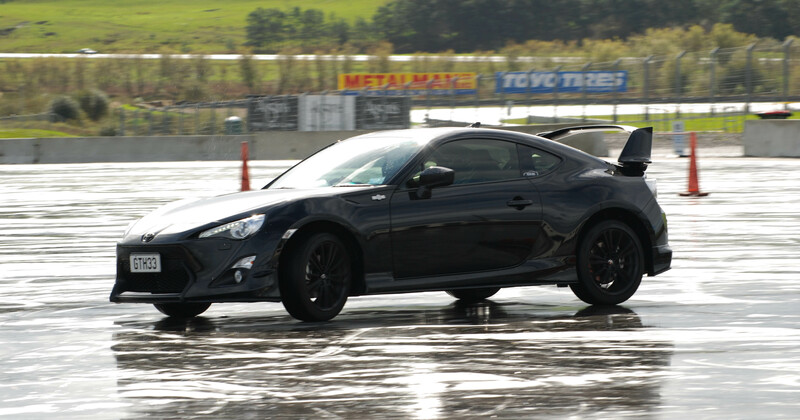 I was very happy when I saw this FT86 parked up outside, but even happier when it hit the track. 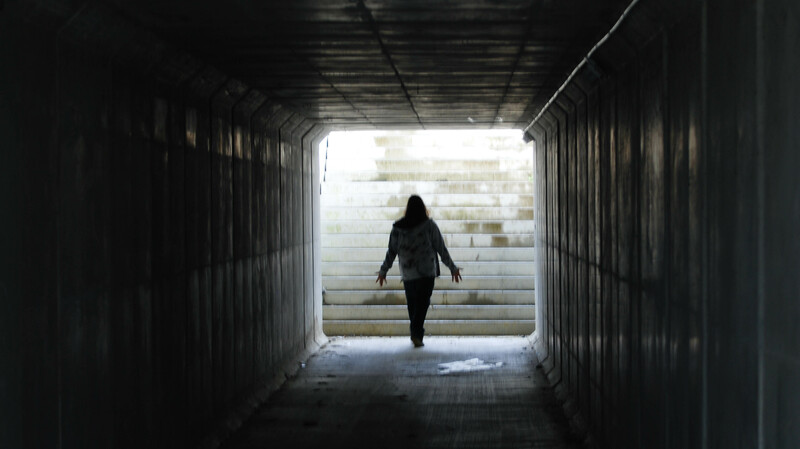 Another tunnel runs under the track for spectators to walk under to access the middle area. The view from the grand stands was very exhilarating, with a massive drop right behind us. Mr. Lim seemed to have a few problems today, with the ignition fuse playing up on him. Luckily he has a loyal following to push his car off the track for him. It is always nice seeing twins, especially of the mechanical kind. 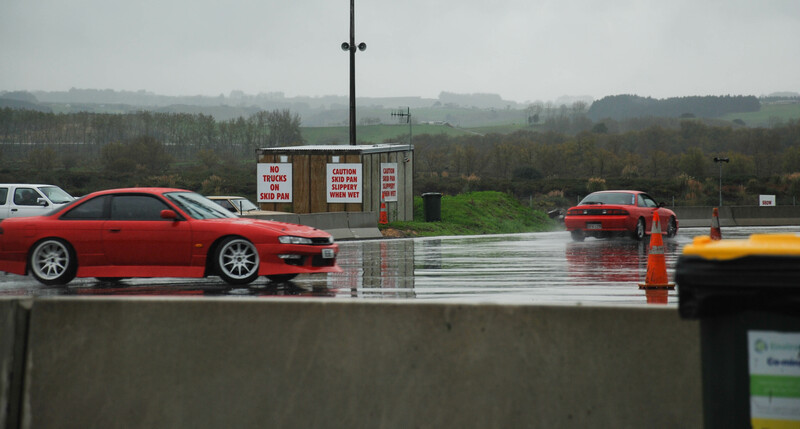 These two red silvias were giving the track havoc all day long. 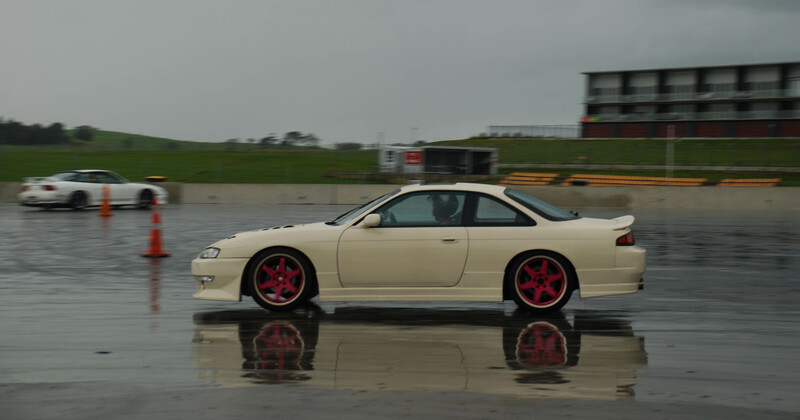 Lets not forget that the track IS very slippery when wet, I think this cefiro got a little bit of a fright when he came a little to close to the exit wall. 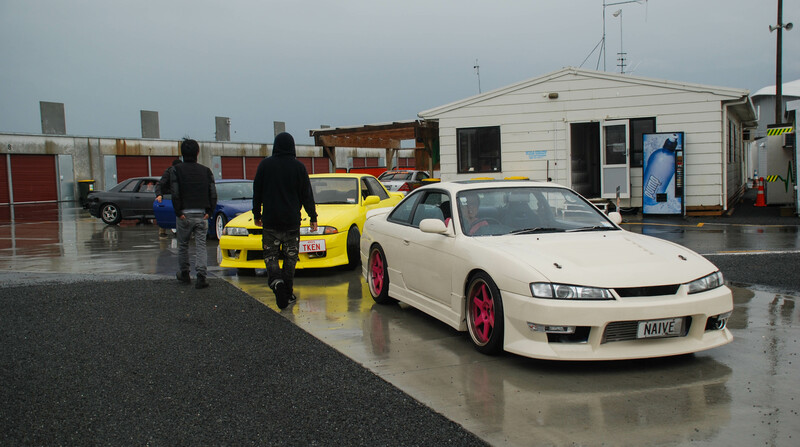 Again we can see that the spectators also bring something to the table, with this S14 and RX7. Throughout the day the pad didn’t dry up at all, so most of the drivers swapped their tires out for more gripper ones. 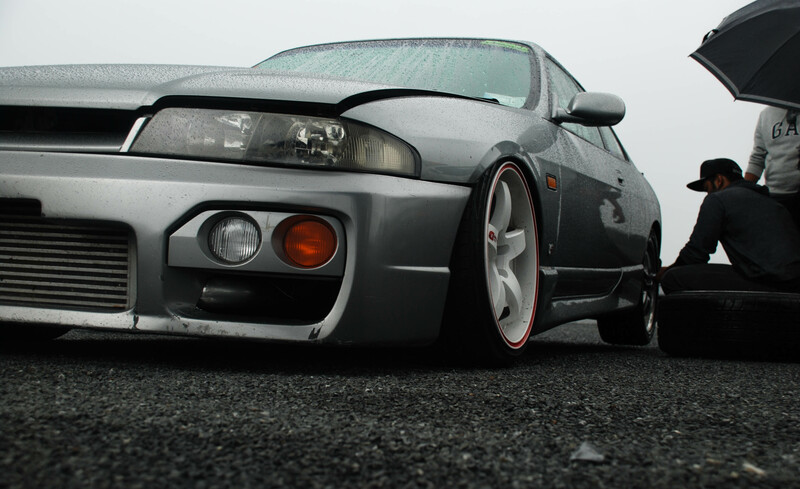 I had a little bit of a closer look at this S13, and even though it was sitting for most of the day, I spotted some previous battle scars that mean’t it liked to battle too. As the day went on the drivers didn’t seem to care about lining their cars up straight, they just wanted to get out there to get the most out of it. 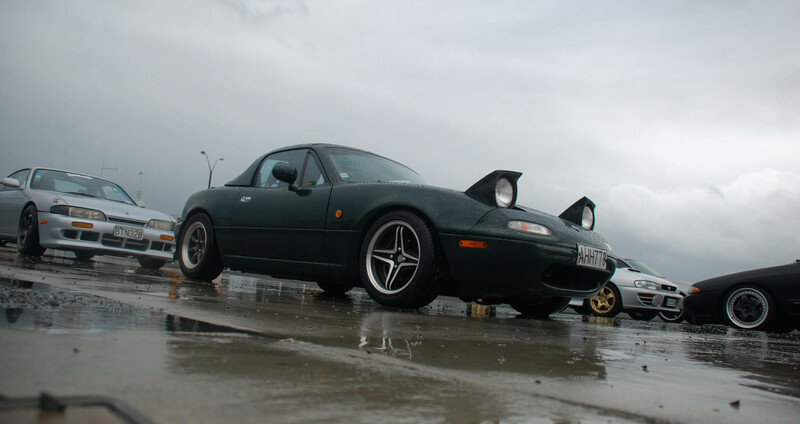 I would have to say that the most controlled group of cars out there today was the MX5s, singles and tandoms, they put on a good show for everyone. 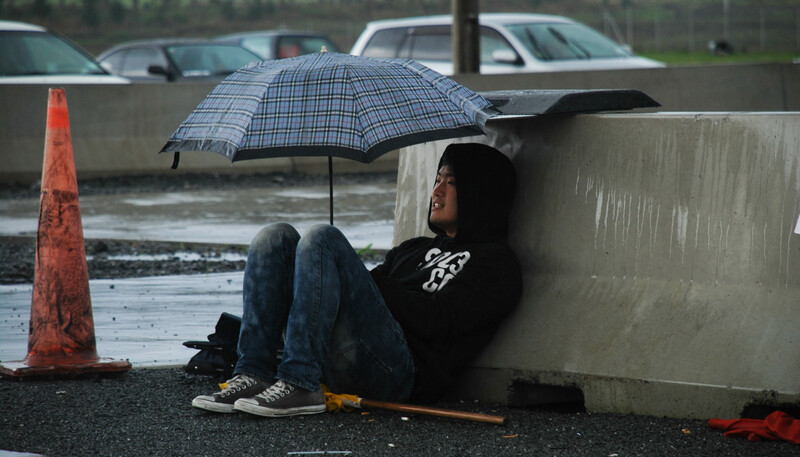 It was about 4:00 and most of the drivers had had enough, they were tired wet and sick of spinning out. Mr. Lee was having a little nap while the last few cars head out for the last hour of fun. The JDK racing crew are a good bunch of people, the atmosphere is great and they always have a smile on their faces even when your asking for help. Big thanks to the JDK crew, especially Juhan and Brian for putting on such an awesome event. spelt brian wrong at the end haha, good read though. Thanks Jesse, I have changed that spelling mistake.